All the material from "Weight Loss - A Neurolinguistic Perspective." "Weight Loss - A Neurolinguistic Perspective" has been one of my most popular workshops. Contained in this online video-based program is all the material from these workshops. Weight loss and slimming. The premise of this work is that for so many clients with weight issues, it quickly becomes obvious that the issue is not the food. The issue is how people think, feel and make decisions. The other thing that is quickly so obvious is that it is rarely the individual's fault about their weight problem. We live in an information age of abundance and the constant cultural push to consume more and more is ever present. Some individuals are more susceptible to this information push than others but this can be remedied. This is the main message of the material in this unique program. "Andrew has a truly unique way of looking at all weight issues. The whole day was extremely thought provoking and unlike anything I had previously heard about weight, an excess the which I have carried for the whole of my adult life. Ideas around how people process information & consequentially food were belief shattering. I shall be forever grateful for Andrew putting on this event and sharing his insight with me and "if the proof is in the pudding" I have lost over a stone by doing absolutely nothing accept paying attention and considering the information shared with us on the wonderful life changing day. Thank you Andrew, please run many more, the world needs you!!" Erica - NLP trainer, coach & therapist. Having worked with enough clients all reporting the same problems it has been possible to start to distill the patterns that they often have in common. This was then the basis of the workshops which enabled me to field test the data and gather better feedback on the processes. This material has been presented in the UK (Harrogate, London, Newcastle) , India (Bangalore, Trivandrum), Poland (Warsaw) and the USA (Washington DC, Boulder Colorado). "Slimming in my Attic" won't show you anything about calories or dieting or how to lose weight effortlessly. You probably already know a lot about that, have spent the money, bought the expensive herbal pills and hardly used that discounted gym membership. But this program will show you what to do about the psychological and emotional differences to better enable to think and reason like a thinner version of you. I can offer you no guarantees at all. But I am certain that unless you have attended my trainings on this subject before (or bought the previous product) then most of the material here will be new to you. How information consumption style matches how we consume food. People who are really good at loading you up with things you don't want and what to do about them. How to really say "No!" Dealing with reactions to saying "No!" Some people give you love...others give you cake. A classic emotional chain reaction and ever ending cycle of guilt and regret. How regret about overeating might be trapping you in the past. The classic pattern of the yo-yo dieter. Is a diet really needed, or do you just need to make better decisions? Using your mind to control your thinking about food. Psychologist Stanley Schacter identified some traits common to overeaters. How mathematical theory influences our food choices. Differences in how we organise time will affect how we think and behave. Is it really better to be fat than be wasteful? A trick for dealing with stored guilt. Another trick for losing some unwanted baggage. How to remove guilt forever. Do cravings really exist? I don't think so. A useful therapy trick to change undesired feelings. Can simply changing sleeping habits improve our eating habits? 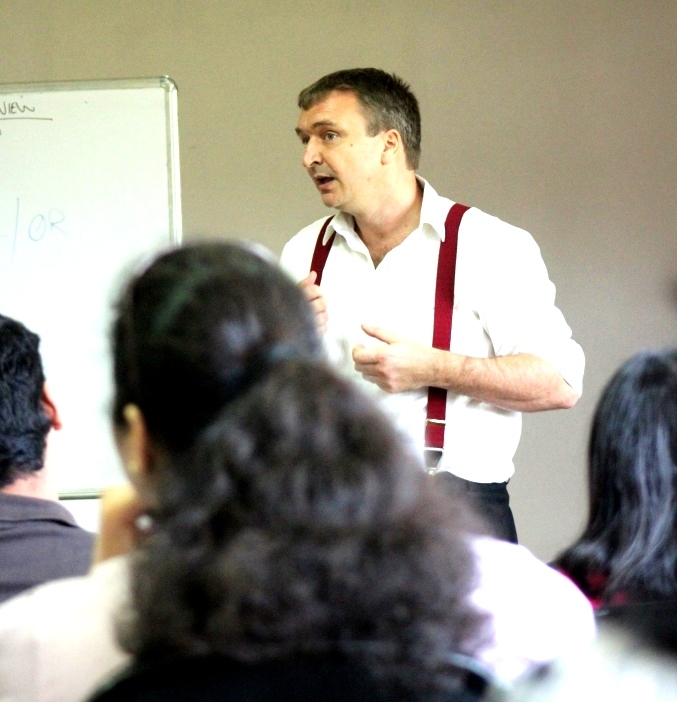 Recording of the entire workshop delivered in Bangalore, India to 45 nutritionists, therapists, doctors and clients. Your comments and feedback here! Time after time Andrew delivers, but this is something we can all take something from. Diet and nutrition is important, and while this won’t offer formal diet and nutritional advice, the mindset and information you ingest around weight loss is just as important as the food you eat. This is no nonsense, no angel channelling, no madness. Just powerful effective information. It is with great annoynce that I am forced to doff my cap once more Austin!